Surviving Madness Surviving Madness: ATTENTION BLOGGERS: Sign up for the iPad Frenzy Giveaway! ATTENTION BLOGGERS: Sign up for the iPad Frenzy Giveaway! 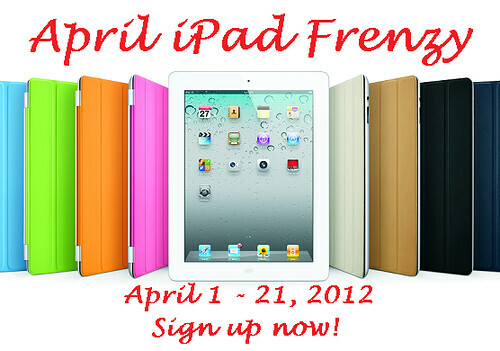 The February Frenzy iPad2 & Cash giveaway was such a success that we’re going to have another one in April! - Giveaway will be open world wide! - Send your $11 (+$2/addl link) signup fee to alice@bayareamommy.com AS A GIFT or add $0.60 if sending as a service. Please write your blog’s name on the notes. - Fill out the signup form HERE and be sure to say that Surviving Madness referred you!